The SH Book Company: Until the company puts up their own website, you can find out a little bit about the company here, who the board members are, and how to order the book from them. MISTAKES: As mistakes have been uncovered in the latest printing, they have been listed. You can help by sending in any additional ones you find to Cooper@weelyrd.net with "Cooper Errata" in the subject line. Bass Runs: A very few of the songs in the 2012 Cooper SH have "gospelly" runs shown in the music. But we've all been to singings where the basses do something not in the book. Here are five. Please send any additional examples to Cooper@weelyrd.net with "Bass Runs" in the subject line, and they'll be added to this collection. The index is based on the information provided in the 2012 edition on the upper right-hand corner of each song. This PDF document is available for download without any charge. Print at 100%, portrait orientation, (turn off auto rotate), double-sided. One can then staple on the left, and trim (leave a flap to fold over and conceal the staples' rough side) to fit just inside the covers of the tunebook for easy carrying around. There was no room to include this index in the printed and bound book. Allowing singers to print it out for themselves and tuck it just inside their books is the compromise arrived at by the music revision committee. Download the PDF. 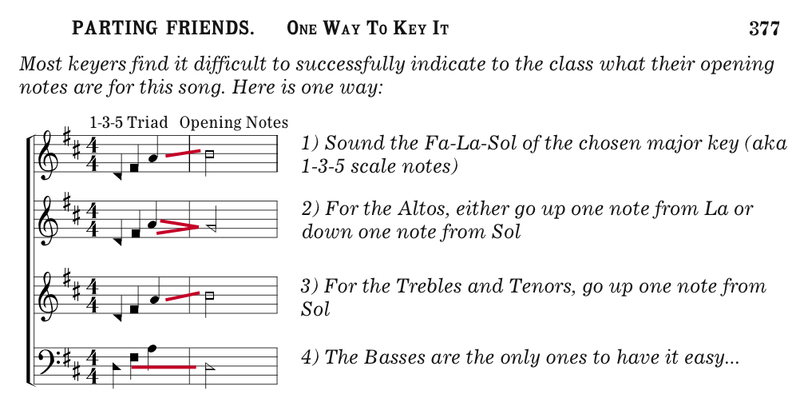 Thought You Knew How To Use the Tune Index? The Tune Index is now to be found at the back of the book. It has several new features: tune names which begin with "The" are listed both under the "Ts" and under the 2nd word of the tune name; tunes which appear in both the Denson Sacred Harp and the Cooper Sacred Harp but with different tune names, have both tune names listed; the tune names for minor tunes are printed in bold, making them easy to spot; anthems, duets, and major/minor companions are listed both under their respective tune names and in separate lists on the last page of the Index. Songs with unwritten "bass runs"
A small "Bass Runs" PDF booklet has been put together of some of the gospel songs that have unwritten notes for the basses to sing. All songs that were in the 2006 edition are present in the 2012 edition, but a few of them are now on new pages. The 2012 music revision committee apologizes for this but the result is that the moved songs are in much roomier locations and look much nicer and are easier to sight-read. New Locations. After moving the overly-crowded songs to their new locations, the music revision committee found to their joy that there was space in which to add new songs. Some of these are newly composed, and some are older songs inexplicably not in the 2006 edition. Download the list of songs new to the 2012 edition. The quite clever singers in Texas have produced a comparison list looking at the latest editions of the Denson Sacred Harp and the Cooper Sacred Harp, for the tunes that the two books have in common.